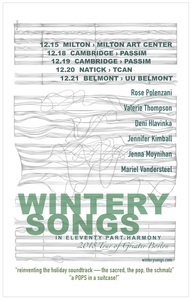 Updates on various members of the Wintery Songs collaborative! Rose Polenzani, Laura Cortese and the Subrosa Three Mile Island Songwriter Retreat folks just put on two nights of fabulous shows at Club Passim! Rose Cousins' new record Natural Conclusion is officially released Feb 3 and her tour starts Feb 8 in DC! Laura Cortese and the Dance Cards (which includes Valerie Thompson and Jenna Moynihan) have a new record! Jennifer Kimball's new record Avocet is officially released March 3 - crowdfunding is still running for pre-orders! First two shows SO FUN. Three more to go! KICKSTARTER RUNNING SHORTLY! COME SEE US ON TOUR!